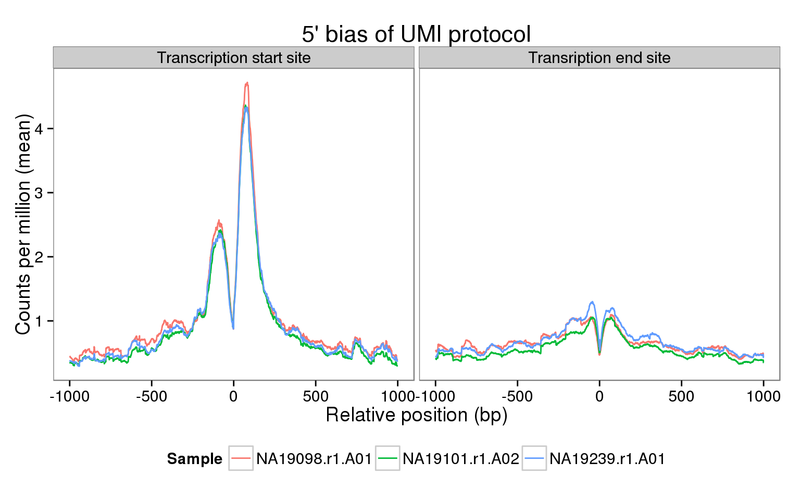 From the sequencing pipeline, the bam files for the molecules are in bam-rmdup-umi and have the filename structure individual.replicate.well.trim.sickle.sorted.combined.rmdup.bam. Unfortunately, after processing with UMI-tools, the bam files are no longer sorted. It is necessary to sort them and then index them to use with genomation. The main caveat of this analysis is the very low coverage per gene of each single cell. The median across the genes for the mean number of molecules across these three samples is only 1.6666667 molecules.